After accompanying Gijs and Han on their assault on He Huan Shan (鐵屁股) last Sunday, I was back there again on Saturday! 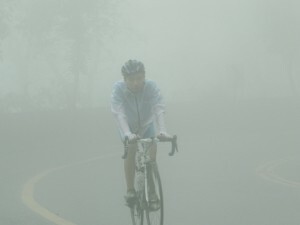 Stage 4 of this year’s National Cycling Club Series will be the He Huan Shan climb from Puli to Wuling on 1 May. 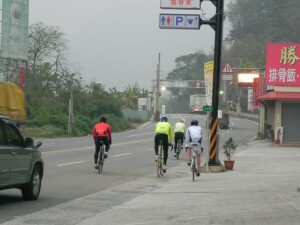 With stages 2 & 3 coming up in 3 weeks time there are many cyclists putting in long kilometers around Taichung to get themselves into top shape. 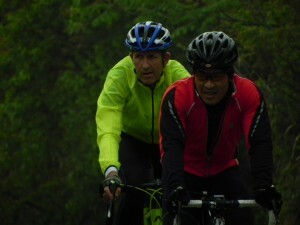 I was supporting a few of my team-members who were keen on testing themselves on the mountain this weekend. The forecast was for a maximum of 8°C at the Wuling pass – 3275m. It would have lucky to get close to that today. Everyone is pretty confident after a morning coffee and ready for what is to come. Well, almost! 6.30am departure. There’s 15km of undulating road that climbs gradually. Then the main climb begins, basically 40km all the way up. The grey-out ahead is not a good sign. Fog and chill await ahead although nobody knew how bad it was going to get. 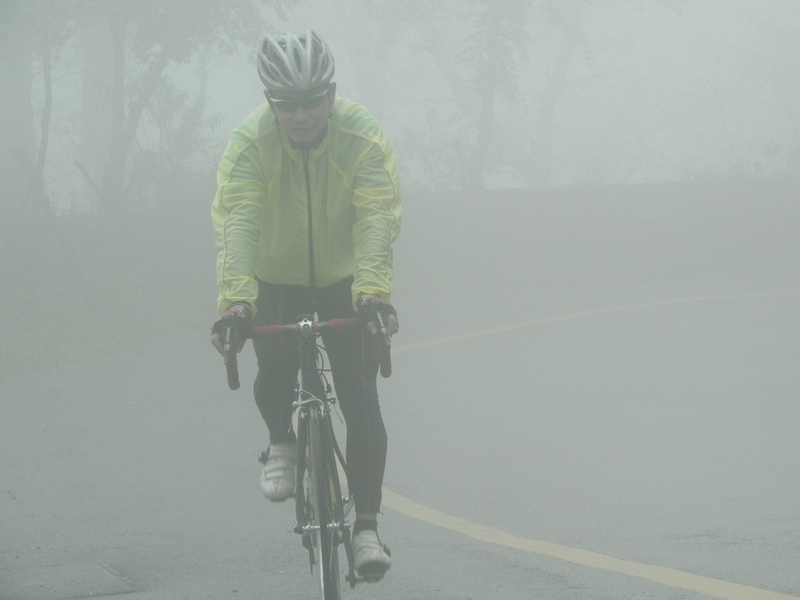 After 600m of vertical ascent to 1100m it’s cold, but not foggy. Hopefully it will stay this way. 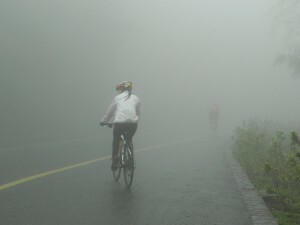 Having climbed through 2000m the temperature must be below 5° here. The cloud is thick and it’s raining off and on. This lady was doing a cross-island ride from the Port of Taichung in the very West to the Port of Hualien in the very East. She has no doubt she’s going to make it. Lucky they chose today. Later in the evening, it started snowing and traffic could not move. The temperature only went as low as -1. Still it would have been very uncomfortable and even dangerous on the long descent to the East coast. Sunday morning has seen a good fall of snow in the area. She heads up into the mist. You-Zheng soldiered on ahead of everyone but he was not quite prepared enough. The cloud very briefly cleared now and again. 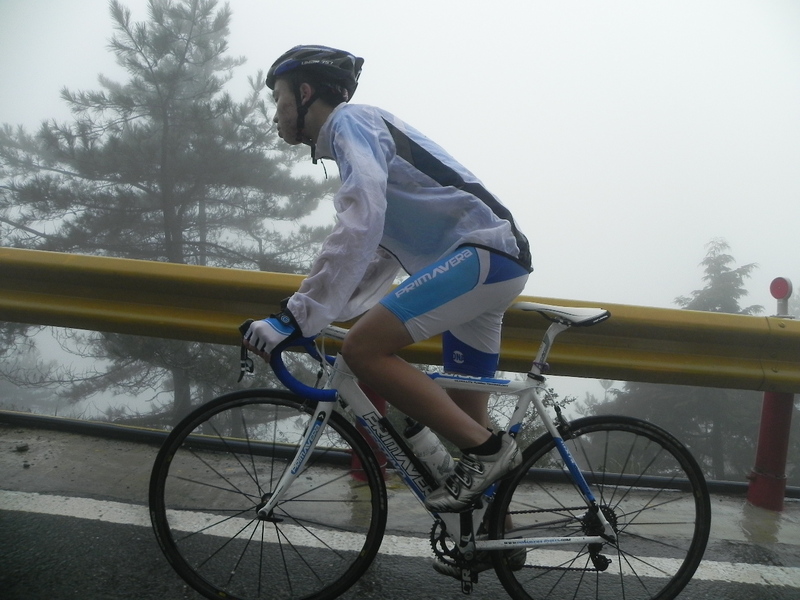 It was ok when you kept moving but at 2900m and 3km from the top, it just got too cold. Nobody in the group made it up today. Hopefully we’ll find time to give it a few more tries in late April before the main event. 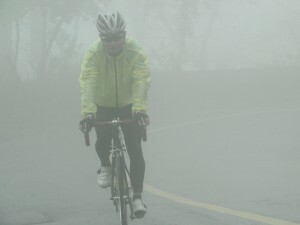 The weather will be better although you still have to choose your day carefully.